Purchase today and use it later or give it as a gift! Prior to finalizing your pampering spa service purchase please review our spa policy regarding refunds and adjustments. View our Spa Policies. 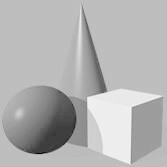 Services/packages are non-refundable. All products sales are final. Deep cleanse and reveal softer, smoother skin. This mask combines three deep-cleansing clays—Kaolin, Diatomaceous Earth and Illite—with Matcha Green Tea and Seaweed to help improve skin texture and overall complexion. This deluxe facial soothes, brightens "tired" complexions and unevens skin tone. Organic botanical extracts provide superior anti-oxidant protection while nourishing seaweed retrains moisture in the cells and builds resistance to external factors, leaving your skin radiant. 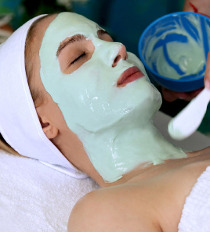 Includes: Cleansing, Toning, Matchafina Mask, Seaweed Extract and a Relaxing facial, neck and décolleté massage with an all natural moisturizer concluding the facial. 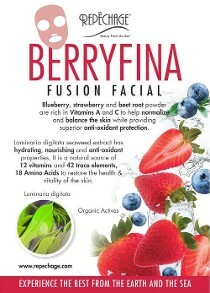 Reveal a brighter looking complexion and improve the appearance of dull, tired skin with Blueberry and Strawberry. These wonderful botanicals combined with deep-cleansing Kaolin Clay, help to reveal a luminous glow. The potent benefits of the exclusive, world-renown Repêchage Laminaria digitata seaweed complex, this fun, relaxing facial treatment provides real nutritive benefits to the skin while stimulating the senses with wonderful aromas. Combined with a soothing ten minute facial massage, this fun treatment will relax and restore. This deluxe facial soothes, calms and protects "stressed-out or acne prone" complexions and decreases skin sensitivity with a simply delicious aroma. Organic botanical extracts provide superior anti-oxidant protection while nourishing seaweed retrains moisture in the cells and builds resistance to external factors, leaving your skin radiant. Includes: Cleansing, Toning, Berryfina Mask, Berry Extract and a Relaxing facial, neck and décolleté massage with an all natural moisturizer concluding the facial. 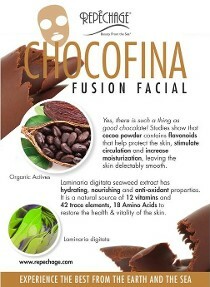 Give yourself a chocolate fix minus the calories and get silky soft skin with this luxuriously creamy facial. Pure Organic Cocoa Powder and Organic Coconut Oil help to moisturize skin while Marine Seaweed, Aloe, Orange Water, Vitamin C and Hyaluronic Acid help skin look and feel smoother, softer and refreshed. Combined with deep-cleansing Kaolin Clay, this helps to reveal a luminous glow. The potent benefits of the exclusive, world-renown Repêchage Laminaria digitata seaweed complex, this fun, relaxing facial treatment provides real nutritive benefits to the skin while stimulating the senses with wonderful aromas. Combined with a soothing ten minute facial massage, this fun treatment will relax and restore. Organic botanical extracts provide superior anti-oxidant protection while nourishing seaweed retrains moisture in the cells and builds resistance to external factors, leaving your skin radiant. 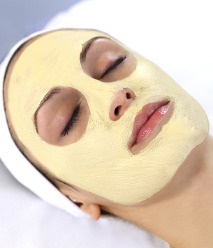 Includes: Cleansing, Toning, Chocofina Mask, Seaweed Extract and a Relaxing facial, neck and décolleté massage with an all natural moisturizer concluding the facial. 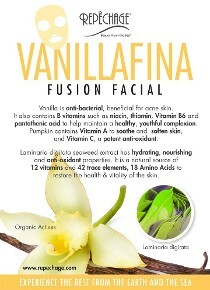 Sensitive skin will enjoy the revitalizing and calming properites of Vanilla and Pumpkin. This mask contains Vitamins A and C from pumpkin to help refine your complexion and restores moisture and potent vitamins to deprived skin, while triple clays deep cleanse, leaving it looking soft, smooth and refreshed. The potent benefits of the exclusive, world-renown Repêchage Laminaria digitata seaweed complex, this fun, relaxing facial treatment provides real nutritive benefits to the skin while stimulating the senses with wonderful aromas. Combined with a soothing ten minute facial massage, this fun treatment will relax and restore. Organic botanical extracts provide superior anti-oxidant protection while nourishing seaweed retrains moisture in the cells and builds resistance to external factors, leaving your skin radiant. Includes: Cleansing, Toning, Vanillafina Mask, Vanilla Extract and a Relaxing facial, neck and décolleté massage with an all natural moisturizer concluding the facial. 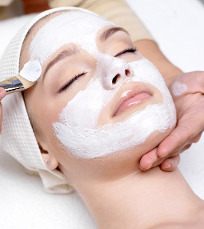 All complexions love the deep cleansing and rejuvenating fresh start of this staple facial. Experience customized Clinical Facial treatments for different skin types, including dry, sensitive, oily/problem and mature skin with fine lines and wrinkles. A great way to get rid of dryness and clean skin up for warm weather. Recommended for All Skin Types, except for Acneic Skin. As gentle as water to the skin...so sensitive skin loves this facial. This premium facial soothes, and protects "stressed-out" complexions and decreases skin sensitivity. Organic Olive oil and olive leaf extracts provide superior anti-oxidant protection while nourishing seaweed retrains moisture in the cells and builds resistance to external factors, leaving your skin radiant.Includes: Relaxing facial, neck and décolleté massage, Hydra 4 Mask and a Hydra 4 moisturizerizing massage which concludes this facial. Recommended for Hyper-reactive to Sensitive Skin. Clears congested pores and bestows a smoother finish to most complexions. The perfect solution to re-engergizing dull or tired looking skin! This facial is specifically designed to provide a deep, effective yet gentle cleaning of congested pores by utilizing sweet pumpkin enzyme to resurface dull skin. Rich in organic ingredients such as: Bilberry Fruit Extract, Lemon Peel Extract, Sugar Maple Extract, Ginger Root, Rosemary and Neem Essential Oil. With more than 100 beneficial nutrients this facial treatment will transform a dull, lifeless complexion and bestow a more youthful vibrance. 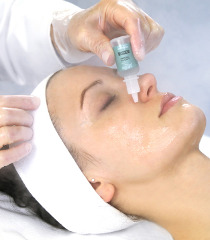 This facial is specifically designed to provide an instant results! It will invigorate, lift and firm mature skin. Long term benefits include preserved elasticity, improve oxygenation and increased cell renewal. This advanced skin repair is a true alternative to surgical rejuvenation. 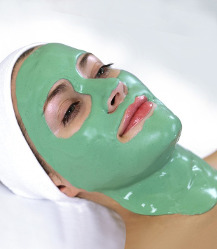 An exclusive combination of a cool Spirulina Mask and Enzymatic Micropeel to revive, tone and firm skin INSTANTLY. No extractions are done with this facial. 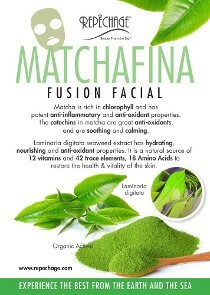 Anti-oxidant Green Tea, Red Clover and Seaweed treatment facial provide an 'Instant Trigger' to younger looking skin. Specifically designed to invigorate, lift and firm mature skin. An enzymatic Micropeel helps to uncover a vibrant complexion. 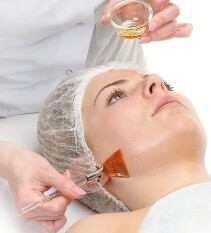 A superlative brightening facials that produces results! This premium European facial dramatically brightens skin and diminishes the appearance of dark spots known as hyperpigmentation due to the sun, acne scars and hormonal changes. Infuses skin with anti-aging benefits and brilliance that lasts. Biolight™'s marine and botanical actives work together to uncover a radiant, more luminous and youthful complexion after the first facial. This peel is suitable for all skin types and results little or no visible peeling. It tightens the skin and restores a more youthful appearance by improving clarity, color, and skin texture.Your skin will glow and possess radiance. We offer a 'Biolight At Home Maintainance Skin Program' to keep the glow going! On-line Special Only! Buy it now, Use it Later! One of 3 premiere anti-aging treatments that transforms skin with layers of pure sea bliss! Experience 3 layers of blissful rejuvenatation of your skin. Fresh seaweed rich in 12 vitamins and phlorotannins, 42 trace elements, minerals, 18 amino acids to help reduce wrinkles, firm and contour. You will experience more calm, clean, young looking skin. Fresh European seaweed rejuvenates, tones and firms tired skin. Enjoy facial, decolletage massages with Seaweed Serum, nutrient rich Seaweed Moisturizer and a cool Pure Energy Seaweed Mask that penetrates layers of the skin for a healthy glow. 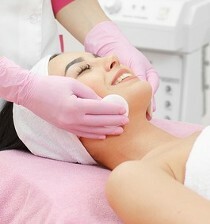 An application of Hydro PFS Complex with a relaxing aromatherapy face, throat, decolleté massage complete this facial. You will also enjoy a light and soothing hand and arm massage. A lovely spa facial experience. You'll see results and enjoy long term benefits of more firm looking skin with a moisturized glow. The ideal facial for stressed or hyper-reactive complexions. Recommended for All Skin Types, Especially brides. #2 of three premiere anti-aging treatment that transforms skin with layer upon layer of pure bliss! Experience four layers of rejuvenating seaweed rich in 12 vitamins and phlorotannins, 42 trace elements, minerals, 18 amino acids to help reduce wrinkles, firm and contour. See the difference: cleaner, healthier, young looking skin. Fresh European Seaweed rejuvenates, tones and dramatically firms the skin. Enjoy facial and decolletage massages with Seaweed Serum, nutrient rich Seaweed Moisturizer and a cool Pure Energy Seaweed Mask followed by a Mineral-rich Thermal Mask that allows for total penetration of the layers. 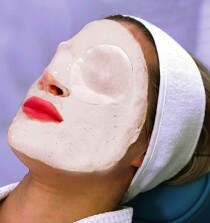 An application of Hydro PFS Complex completes this wonderful facial. A relaxing aromatherapy face, throat, decolleté, hand and arm massage gently calms the mind, body and spirit. A lovely facial experience. Immediate results and long term benefits: younger looking skin with visibly renewed firmness and a moisturized glow. A transforming facial and decollete treatment that richly hydrates and smooths while restoring cellular plumpness. Provides results that are impressive! Internationally known Premium Repechage™ Anti-aging Treatment takes on added benefits of a Brightening Facial Serum and an Under Eye Brightening Serum that is visually makes tired eyes disappear! It's three spa services in wrapped into one! Anti-aging results from one treatment! European Seaweed rejuvenates, tones and dramatically firms the skin. You will emerge with renewed skin and an enlivened mind, body and spirit. 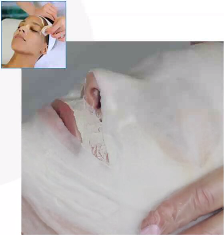 nIdeal facial for stressed or hyper-reactive complexions. Recommended for All Skin Types, Perfect for Brides! Good news! This is a natural holistic approach to combating acne from the inside out, with no negative side effects. A natural holistic approach to combating acne from the inside out. The treatment line works to control oil production from overly active sebaceous glands, while protecting your skins natural moisture balance. Combining natural herbal and marine ingredients, Hydra Medic® is your answer for noticeably flawless skin. Porprhyridium/Zinc complex fights bacteria, adds moisture, helps skin regulate sebum levels. Ichthammol- part of sea mud mask, rids skin of bacteria, absorbs sebum after extraction process. Synergistic Tea blend is a key ingredient in our 3-Step Calming Mask. Green, White, Yellow and African Red Tea, soothes the skin and provides anti-oxidant benefits. Freeze Dried Spirulina is a fresh water micro-alga that contains all of the essential amino acids. It is an excellent free-radical scavenger containing Beta-Carotene. Triclosan helps to control problem causing bacteria. Essential Oils of Basil, Chamomile, Lavender and Ylang Ylang leave the skin calm and refreshed. Good news! This is a natural holistic approach to combating acne from the inside out, with no negative side effects. Perfect for mature skin that is experiencing hormonla fluctuations in this body area common during the years of 40's and more. A gentle yet effective Repechage Glyco Sea Peel gives your skin a second chance at being youthful with immediate brightening results! Skin is more vibrant and show less signs of aging immediately. After a gentle cleansing with an Ecocert seaweed peel which removes dull skin cells, your complexion will be rejuvenated showcasing fresh new skin cells. Skim is infused with vital trace elements, minerals, Vitamin Serum, Opti Lift Serum and Repechage Lift Cream for amazing results! The results are fast and impressive! Can be done during lunch time without redness! This extremely relaxing full body therapy combines stone therapies (hot & cold sea stones) with the signature anti-aging Repechage Four Layer Facial. This service creates balance throughout the body and leave you feeling deeply relaxed. a resort level spa experience that will keep you smiling.